I really love to clean… no seriously, it is weird, but true. Okay yes I get super sick of cleaning my house all the time. But nothing feels better to me when I am super stressed… to just do some crazy cleaning. Spring cleaning is great for aesthetics and how the feng shui in the house appears, but it is also great for internal work too. In Traditional Chinese Medicine the Spring is associated with the Wood element, and the Liver organ system. The Liver is paired with the Gall Bladder. The Liver governs the tendons and ligaments in the body and is considered the “general organ.” You know the one that tells everyone else what to do, how to do it and go, go, go!!! The Liver is associated with a SOUR flavor and the color GREEN. The Liver is something we tax in our society in so many ways, physically, emotionally and energetically. So this Spring lets do some Spring Cleaning and really help support that Liver!!! Best Liver Formula: Xiao Yao Wan (Free and Easy Wanderer) Tonifies the Spleen and Stomach and moves Liver Qi. And come on… the name kind of says it all; I love to be a free and easy wanderer in life. Single Herbs that are great in Tea: Dandelion Root, Burdock Root, Chicory Root, Turmeric, Artichoke Leaf and my local favorite… Oregon Grape. Foods that Support the Liver: Leafy greens, sour foods like lemon, green smoothies, fermented foods, beets and beet greens and seasonal foods. Hawthorn Berry (Crataegus monogyna or C. douglasii) and Chinese Crataegus (Shan Zha) is an herb that is extremely popular is both Traditional Chinese Medicine and Western Medicine alike. In Chinese Medicine we use Shan Zha to alleviate food stagnation by assisting in digesting meats and greasy foods and to nourish the heart and improve circulation. In Western Medicine hawthorn berry is used to lower blood pressure, lower cholesterol and a great herb for overall cardiac and circulatory health. Since we just had the most gluttonous of all holidays (Thanksgiving) I thought it would be a great herb to focus on this month. It was Thanksgiving 23 years ago that I decided to go vegetarian, and then subsequently vegan and more recently gluten free. When I was 12 I had my first pet, Buddy, a parakeet. This little bird really made me think twice about the turkey focused holiday and I decided I could not eat my beloved Buddy’s turkey friend. So I am thankful for Buddy for laying the groundwork for many positive changes that I have come to make. I am also very thankful for my amazing and supportive family. Okay now back to the topic at hand… hawthorn berries!!! 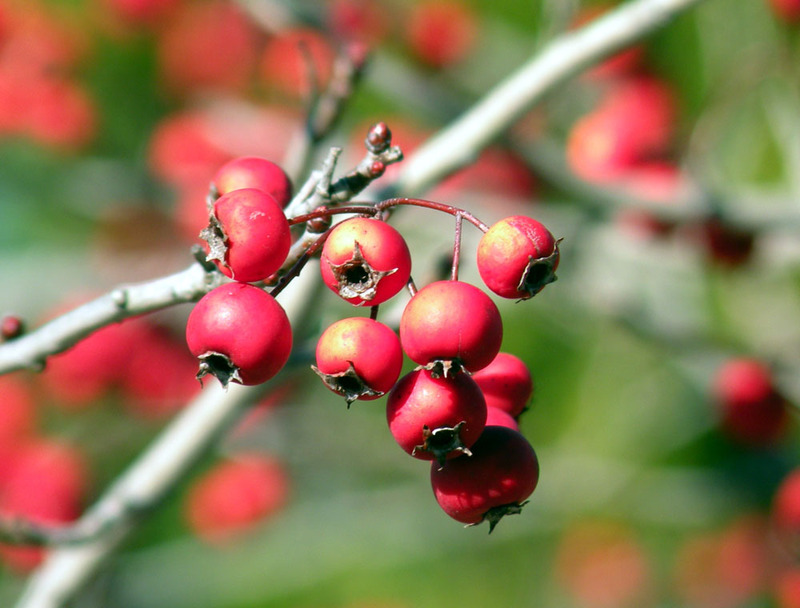 Since we tend to eat lots of high fat foods during the holidays hawthorn berries are a perfect herb to help us digest our favorite holiday foods. Hawthorn berries are available in tea, tincture, powdered and capsule form. Making tea is a great way to enjoy this herbal medicine and you can have it with your meals to help you digest your food. Bring water and berries to a boil, reduce heat to let simmer while covered for 10-15 minutes. Strain out the berries and enjoy! Can also add some sweetener and or lemon juice to taste. A sprinkle of cinnamon is good too. There are many great Traditional Chinese Medicine formulas for eliminating food stagnation and helping to aid digestion of our heavy holiday meals. Bao He Wan- Contains hawthorn and other herbs like Shen Qu* (fermented massa) to digest all types of foods. *Shen Qu is a fermented product, but sometimes contains gluten. Curing Pills (Kang Ning Wan)- is another great formula for reducing food stagnation, but again contains Shen Qu (gluten). Mu Xiang Shen Qi Wan- aids in digestion and is even supportive for digestive issues from a stomach flu. Gluten Free!!! Even though there are great formulas and herbs to improve digestion the best way to feel good over the holidays is to eat healthy foods, eat slowly and chew your food!!! Here is a great site for getting Hawthorn Berries and some interesting history and folklore too… Have fun! When I first learned how to do cupping… almost 15 years ago; I decided to promptly teach my partner at the time (now husband) and family members how to do it. I absolutely loved how it felt and it really was the most effective therapy for chronic neck and back tension. Throughout the years I have seen many more applications for cupping and a couple weeks ago was reminded of the amazing way cupping can vent a cold or flu right out of the body! My coworker Dori White, LMT also does cupping and I came in with the super sniffles, achey body and chills. Next day… gone! No lingering cold or upper respiratory infection for me. Yeah for cupping!!! Cupping can be even more effective when combined with acupuncture. Acupuncture works to balance the body and create homeostasis, cupping only furthers that process. I offer cupping or another form of body work with every acupuncture treatment I do. My favorite way to do cupping is “moving cups.” This is a style of cupping that uses oil or salve on the body first and then the cups are applied… super relaxing and nourishing. I actually use Rescue Rub salve first since it has many healing and anti-inflammatory properties for a more effective treatment. Fall is a time that I feel inspired with food… making good food, going to potlucks and remembering to slow down when I eat. The hustle of summer is over and now is a time for introspection and connection. In Chinese Medicine Fall is associated with the Metal Element and the organ system: Lung and Large Intestine. The flavor of Fall is pungent or expansive and the complimentary flavor is astringent. To help preserve and nourish our Lungs and Large Intestine we need both expansion and contraction. 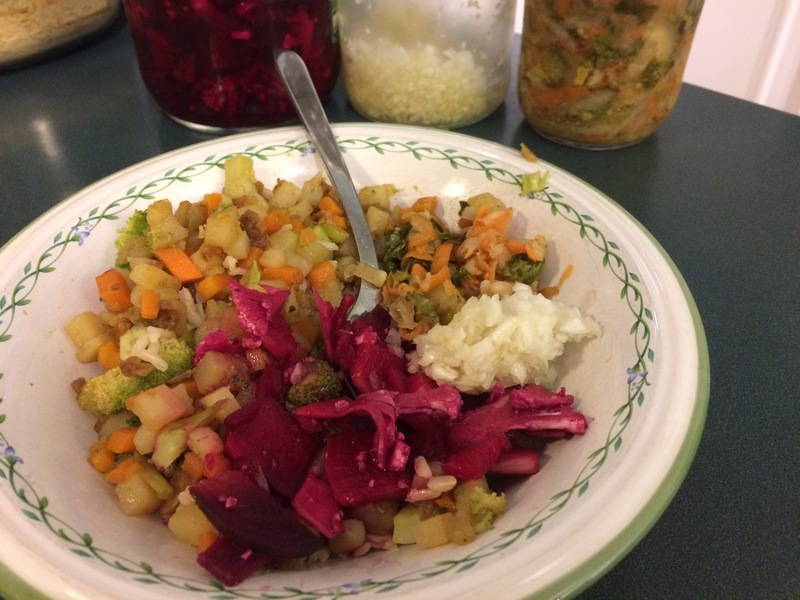 My favorite foods to make this time of year are fermented foods. I recently got a couple really amazing birthday gifts that have super inspired me on my fermented journey. 1) Fermented Vegetables book by Christopher and Kirsten Shockey and 2) Easy Fermentor Kit by Nourished Essentials (a local Portland company). I cannot recommend the Easy Fermentor enough… it makes fermenting so much easier and I love that the end result is already in a mason jar, perfect for storage! So far I have made a few different sauerkrauts and fermented veggie combos that are not only super tasty, but also really beautiful to look at on my plate as well. Fermented foods are a perfect food for Fall, because they really preserve and enhance the flavors of this time of year, extending these flavors through the cold winter months. 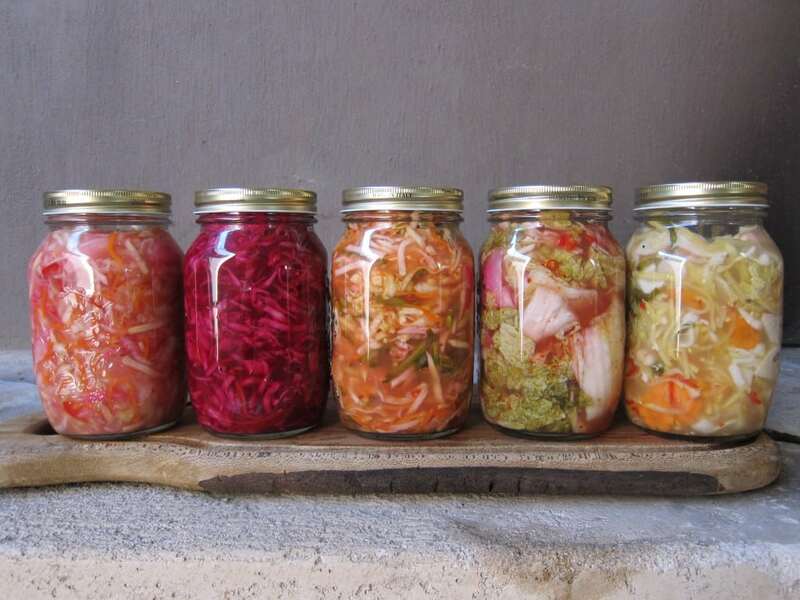 Fermented foods are both expansive and contractive which is in harmony with the nature of this season and supportive of our lovely Lungs and Large Intestine. Our Large Intestine appreciates all the lovely probiotics and restorative function of fermented foods to give us healthy gut flora and our Lungs really appreciate when we put some pungent foods into our fermentation like ginger and garlic. One of my favorite fermented combinations I have really enjoyed is: cauliflower, beets, daikon, cabbage and ginger. The flavors are balanced from a TCM perspective because they have all five flavors: sweet, sour/astringent, salty, pungent and bitter. I also made a Kimchi inspired blend that is super spicy and I feel like it really keeps my Lungs clear to boost my immune system. Dinner with Delicious Fermented Vegetables… Yum!!! Autumn in Traditional Chinese Medicine is associated with the Metal element. The Metal element correlates to the Lungs and Large Intestine. Their primary function is to take in new things and let go of the old. The Lungs control inhalation-exhalation and also control the opening and closing of our pores. Our skin is governed by the Lungs and one way to renew and give new life to our Lungs is through our skin. Our skin protects us from any external evils also known as pathogens like bacteria or viruses. 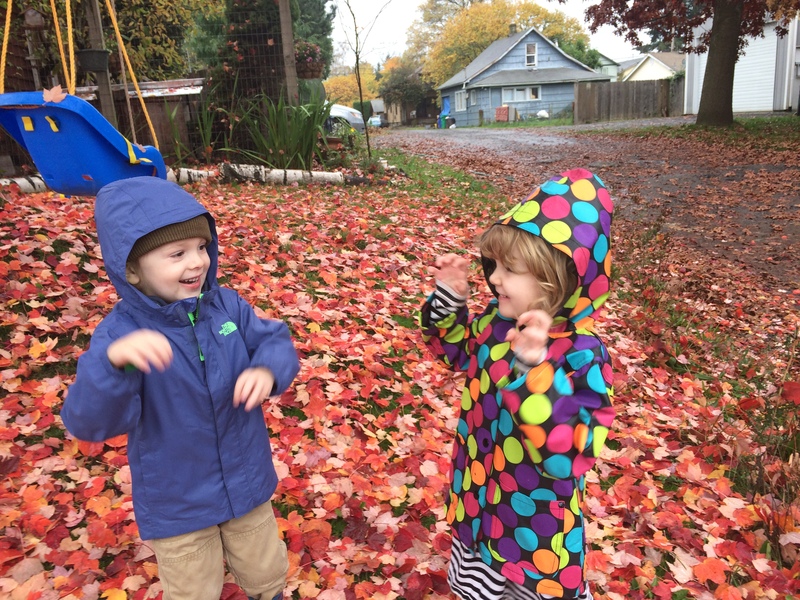 Here are some steps for supporting the Lungs during the fall. Take care of our skin and help it let go of what is not wanted. Exfoliate your whole body with a sugar or salt scrub. See recipe below. Use a detoxifying massage oil to nourish your skin and perform lymph massage while applying the oil. See this site for making calendula oil, a detoxifying oil you can make at home. You can also just use some extra virgin olive oil or coconut oil. Or spice it up by adding a couple drops of your favorite essential oils. Nourish your Lungs with food. Pears are a great food to moisten the Lungs if you have a dry cough or tend towards dryness in your body. You can also make stewed pears (add walnuts to tonify the yang) that nourishes the yin and yang and is aromatic to help open the Lungs. Take an herbal formula to support our Wei qi or protective qi. Like Jade Windscreen Yu Ping Fang San. This supports the Lungs and prevents us from catching a cold or flu. Come in to see Genevieve to help you get the right formula for your constitution. Have a beautiful Fall and stay healthy and happy! Spicy and Sweet Body Scrub 6oz. Mix all ingredients in a glass or metal bowl, using a whisk to uniformly mix. Scoop into storage container. Use on moistened skin to exfoliate, then rinse. Not intended for using more than 1 x per week. *Can also use sea salt for this recipe, especially Epsom salt to penetrate tight muscles. Use caution since salt is more abrasive and can sting on freshly shaven or sensitive skin. Now that the cherry blossoms are blooming and we have all these beautiful bulbs coming up out of the ground with many amazing colors and smells… ALLERGIES!!! Not to fear, Acupuncture is here! Acupuncture and Chinese Medicine have successfully been used to treat allergies for thousands of years. I myself had horrible allergies, asthma, and eczema for many years and the only successful treatment was Chinese Medicine (acupuncture, herbs, diet therapy, breathing exercises). 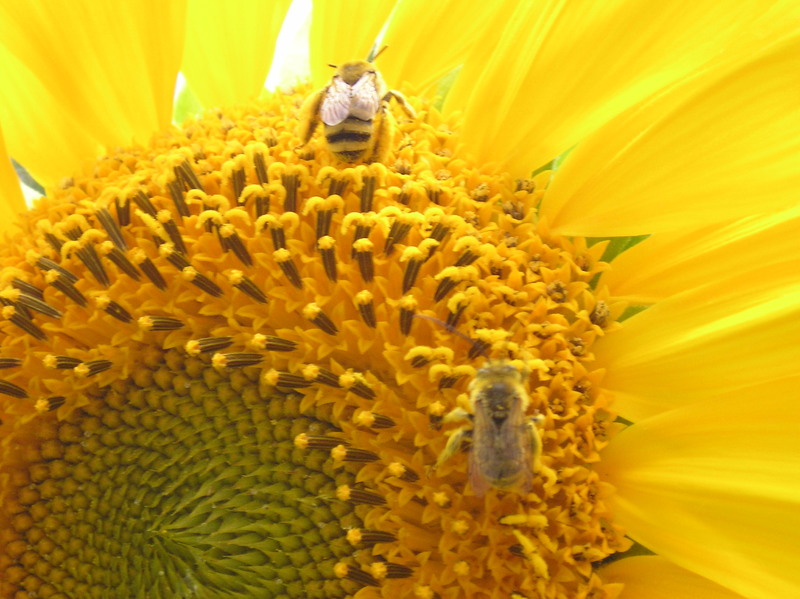 Acupuncture works to reduce allergies by regulating the immune system. When our immune system is overly sensitive our body will react negatively to things we are commonly exposed to: such as pollens, dust, mold, plants, animals, even food that we eat. Acupuncture combined with herbs helps to reduce the histamine response in our body that triggers the inflammatory cascade leading to extra mucus, red itchy eyes, digestive or GI upset, rashes, hives, feeling foggy headed, etc. We treat children of all ages: from infants to toddlers and school aged children. When a small child or infant comes in we use pediatric tui-na and shonishin techniques to address any concerns for the little one. 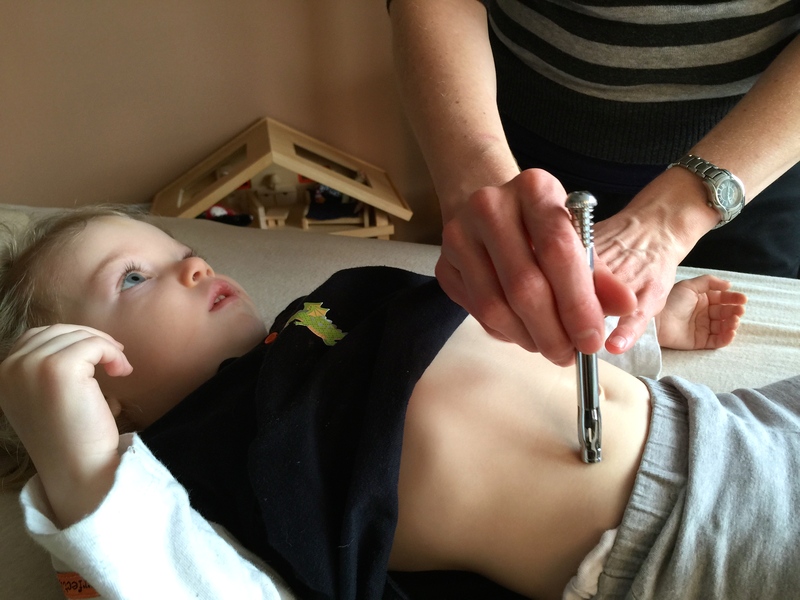 Children are especially receptive to bodywork so usually acupuncture is not indicated. Instead we use massage and shonishin, which is Japanese Pediatric Acupuncture. It involves tapping on specific acupressure points and massaging the extremities. Sometimes even moxa is used, which is compressed mugwort that is lit in a device and applied over the skin. This is a very gentle warming and soothing therapy that can help with boosting the immune system, alleviating pain, reducing anxiety, promoting sleep, and improving digestion. We also carry a line of herbs specific for infants and children called Gentle Warriors from Kan Herb Company and even carry some formulas from The Herbalist that are made especially for children.